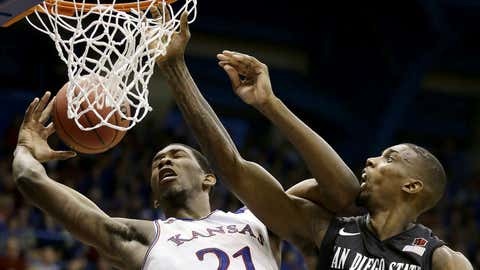 Joel Embiid and the Jayhawks were bested by San Diego State on Sunday afternoon in a disappointing 61-57 loss that ended Kansas' 68-game home winning streak against non-conference opponents. We’d like to tell you that this is all a plot. A ruse. A giant game of possum. That the idea all along was for Bill Self’s team to look roller-coaster crazy (up, then down, then up, then down again); to spend November, December and early January tossing more bricks than Bob the Builder, then turn up for Big 12 play wearing that giant Superman cape and crush the lot of them, same as every year. We’d like to tell you that. Honest, we would. But we’re not sure. And, more to the point, we’re not certain Self is all that sure, either. "We got exactly what we deserved," the Kansas coach told reporters Sunday after a 61-57 home loss to San Diego State, the Jayhawks’ first defeat at Allen Fieldhouse to a non-conference opponent since November 2006. "I thought we’d be a little tougher and more aggressive." 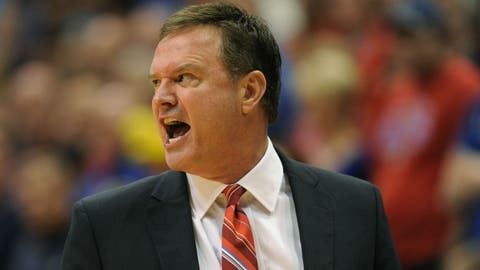 Bill Self told reporters after Sunday’s loss that the Jayhawks got exactly what they deserved. Yes, we c … hey, wait a minute. "We’re not as good as I thought we’d be," Self said. Good, yes. Great, no. Bewildering, no question. A month ago, the Jayhawks lost in Boulder on a crazy buzzer-beater, then responded by going all Washington Generals during the first half at Florida. A couple of weeks ago, they turned around and thumped NCAA Tournament-quality dance partners New Mexico and Georgetown by an average margin of 83-64, and all was right again in the merry old land of Oz. Sunday, in their own backyard, they couldn’t hit the broad side of about six different barns. The wind chill was 13 below zero out on Naismith Drive, and that was a heat wave compared to what the locals were throwing up. It was the Jayhawks’ worst shooting day at home (29.8 percent, 15 of 57 from the floor) since field goals became an official statistic during the 1988-89 season. It was the fewest points scored by a Self Kansas team (57) since a 57-55 win over Memphis in St. Louis on Nov. 17, 2009. It was the second-fewest points scored by a Self Kansas squad in Allen Fieldhouse and the first time the Jayhawks had been held below 59 points at The Phog since they netted 55 versus Kansas State on Jan. 14, 2006. And the big one, of course: It was the first KU loss to a non-league foe at home since a 78-71 stunner against Oral Roberts on Nov. 15, 2006. "They were better than us today," Self told KUSports.com. For coaches, losses can have shades of gray, buried in the margins, but even the finer points of this one seemed to be caked in black. Big men Joel Embiid and Perry Ellis shot a combined 4 for 13 from the floor, and Ellis, Kansas’ best veteran interior scorer, didn’t make a field goal until there was 8:13 left in the tilt. After a month of moving forward, point guard Naadir Tharpe (2 for 10, 1 of 5 from beyond the arc) took a few baby steps back. And the only thing more damning than the fact that KU couldn’t buy a bucket in its own backyard was that the Aztecs found repeated ways to get second chances — the visitors snatched 19 offensive rebounds and out-boarded the Jayhawks, 51-39. Box-out opportunities were missed almost as often as shots were. We’re about to play some San Diego States every night. Which is not to take anything away from San Diego State; like Toledo before them and Georgetown and New Mexico and Florida and Colorado and Villanova and Duke (you get the point, this was an absolutely harrowing non-conference menu), they’re all kinds of legit. If the Rockets were designed to simulate what a scrappy 13 or 14 seed looks like in the NCAA tourney, the Aztecs (12-1) are no worse than a physical, savvy 6 or 7. While the Jayhawks kept showing their age, coach Steve Fisher’s men did the same, weathering several KU storms thanks to the steady hands of seniors Xavier Thames (16 points) and Josh Davis (10 points, 14 boards) and a jaw-dropping six blocks by sophomore forward Skylar Spencer. Fisher’s game plan was admirable, too, doubling Embiid at nearly every turn, hoping Ellis didn’t clean up underneath (a gamble that surprisingly paid off) and daring the perimeter-challenged Jayhawks to make hay from the outside. The Aztecs have the No. 1 field-goal defense in the country for a reason: KU missed 11 of its first 13 attempts from the floor, 17 of its first 20, 30 of its first 38 and whiffed on its last six of the first half. The Baby Jays missed more bunnies than Yosemite Sam in a Warner Brothers cartoon. Which only underscored another concern, especially as the curtain opens on Big 12 play this week: The Jayhawks still struggle to score consistently in the half-court, without the help of fast-break run-outs and easy scores in transition. KU went into the weekend ranked 196th in the country in steals per game (5.8), 287th in opponent turnovers per game (11.1) and 303rd in opponent turnovers per play — a ratio of 13.8 percent. A year ago, KU racked up 7.0 steals per game and forced an opponent turnover on 15.7 percent of the other guys’ possessions. The Baby Jays woke up Sunday morning ranked 107th in the nation in lowest opponent field-goal percentage on shots that weren’t blocked, with foes connecting on 51.9 percent of their looks. That’s up more than four points from a year ago, when Jayhawk foes made just 47.7 percent of the attempts Jeff Withey couldn’t get to. Mind you, some of those trend lines could be blamed on quality competition as much as youth. Sunday brought KU’s eighth opponent ranked among the Ratings Percentage Index Top 50; of that particular subset, the Jayhawks have won four and lost four. As of early Sunday night, the average RPI rank of Kansas’ past five opponents (at Florida; vs. New Mexico; vs. Georgetown; vs. Toledo; vs. San Diego State), Big Dance contenders all, was 36.2. The average rank of the next five (at Oklahoma; vs. K-State; at Iowa State; vs. Oklahoma State; vs. Baylor): 22.4. "We’re about to play some San Diego States every night," Self told reporters. The good news for the Baby Jays is that the non-league gauntlet is officially done and dusted. But the hard part, the real tests, have only just begun.